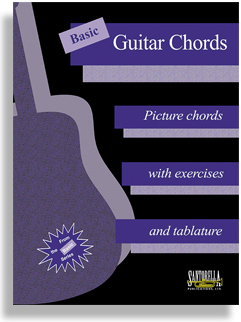 Basic Guitar Chords is our best selling chord book and an absolute must for any beginner. Learn all your basic chords by seeing actual photos of fingers on the neck and simple fret board diagrams of each chord in tablature. This reasonably priced book, which also features a section on proper form and easy instruction for tuning the guitar is only available from Santorella Publications. Basic Guitar Chords comes with a promise. You will be playing Basic Chords in no time flat!